MARVEL SERIES 8 MARK II VERTICAL TILTING BAND SAW, S/N 826403. KALAMAZOO STARTRITE VERTICAL BAND SAW WITH WELDER, S/N 32023. DAKE H FRAME 50 TON PRESS. OOYA RE2-1300A RADIAL DRILL PRESS, S/N OA7-2787. COMMAND TOOLING THERMOLOCK TOOL SETTER. 2013 ELBO CONTROLL LARGH MODEL 7550 TOOL SETTER. SOUTHWEST CRANE 3 TON OVERHEAD CRANE WITH APPROXIMATELY 50 FEET WIDE. 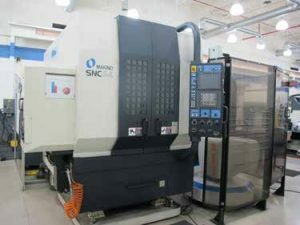 MAKINO SNC-64- GC GRAPHITE CNC VMC, WITH FANUC PROF CONTOL, 15 ATC HSK-63F TOOL HOLDERS, 20,000 RPM, WITH SYSTEM 3R ROBOTIC TOOL CHANGER FR 154 ATC GRAPHITE WORK PIECES, 23.6’’ X 15.7’’ X 15.7’’ (XYZ), S/N 200-551- 10. 2005 OKUMA ACE CENTER MB-46VAE CNC VMC, WITH OSP-P100M CONTROL, 10,000 RPM, 32ATC, CT-40, PROBE, CHIP CONVEYOR, SIDE MOUNT TOOL CHANGER, S/N 115783. 2006 OKUMA MC-V4020 CNC VMC, WITH OSP-E100M CONTROL, 10,000 RPM, CT-40, 32 ATC, CHIP CONVEYOR, SIDE MOUNT TOOL CHANGER, CHIP CONVEYOR, S/N 0862. 2007 HURCO VMC 42 CNC VMC, WITH ULTIMAX 2 SCREEN CONTROL WITH GRAPHICS, 24 ATC,PROBE, CT-40, SIDE MOUNT TOOL CHANGER, S/N H-H40405. NAKAMURA SC-150 CNC TURNING CENTER, WITH FANUC 18i-T CONTROL, 8’’ CHUCK, 12POSITIN TURRET, CHIC CONVEYOR, 2 AXIS, S/N S151205. TRAK DPM 3 AXIS CNC MILL, WITH AGE CONTROL, S/N 96-2355. OKAMOTO OGM250 UNIVERSAL ID/OD GRINDER, 8.6’’ SWING X 19.84’’ CENTERS MODEL NO. OGM-820UDX, S/N: 13214. OKAMOTO 16 X 32 HYDRAULIC GRIND X HYD SURFACE GRINDER, MODEL ACC16-32ST, S/N88264. OKAMATO GRIND X 8 X 20 HYDRAULIC SURFACE GRINDER, MODEL ACC8-20DXV, AC DRIVECONTROL, S/N 62727. 2007 MITSUI MODEL MSG-200MH, 6 X 12 HYD SURFACE GRINDER, WITH SONY DRO ANDOPTIDRESS, S/N 20070210577. LARGE SELECTION OF GRIND ALL NO. 1, MOTORIZED MODEL 202 GRIND ALLS. SINE PLATES, DRESSERS, V BLOCKS, PRECISE PVSF-1 HIGH SPEED SPINDLE. CHICK AND KURT VISES, TILTING TABLES, INDEXERS AND SUPPORT. LARGE SELECTION OF CT-40 TOOL HOLDERS (OVER 300). PRECISION BORING BARS, SPRING COLLETS, CARBIDE TOOLING. OVER 15) ROUSSEAU 8 DRAWER WHITE TOOL CABINETS. TRIMOS FOWLER V PLUS HEIGHT GAGES. MICROSCOPES, MICS, GAGES, AND SUPPORT. (OVER 10) STARRETT CRYSTAL PINK 36 X 48 GRANITE PLATES. NIKON V-12B, 12’’ OPTICAL COMPARATOR, WITH QUADRA CHECK 2000. BAUSCH & amp; LOMB STEREO MICS. 2) 2008 MITSUBISHI EA12V AND 2008 MITSUBISHI EA12VM CNC ROBOTIC EDM CELL SYSTEM,WITH 111 EDM ATC ELECTRODES, MELFA 5 AXIS ROBOT, S/N 08EAA035, 58E1A057. 2) 2008 MITSUBISHI EA12V AND 2008 MITSUBSHI EA12VM CNC ROBOTIC EDM CELL SYSTEM,WITH 111 EDM ATC SYSTEM 3R ELECTRODES, MELFA 5 AXIS ROBOT, S/N 08E1A040, 57E1A003. 2014 MITSUBISHI ADVANCE PLUS MV1200R CNC WIRE EDM, WITH AUTO THREADING, 15.7’’ X 11.8’’ X 8.7’’ (XYZ), TAPER ANGLE, SUBMERSIBLE CAP 1102 LBS, S/N DOOM1911A, MODEL W31MV-2, OPT DRIVE SYSTEM. 2000 MITSUBISHI FA10SM CNC WIRE EDM, SUBMERSIBLE, 13.8’’ X 9.8’’ X 8.6’’ (XYZ), WITH AUTOTHREADING, S/N 05015226. 2008 MITSUBISHI ED-2000NC, CNC EDM HOLE POPPER WITH GRAPHIC CONTROLS, S/N 1100-0004. SINE PLATES, DRESSERS, V BLOCKS,PRECISE PVSF-1 HIGH SPEED SPINDLE. OVER 20) ROUSSEAU 8 DRAWER WHITE TOOL CABINETS. BAUSCH &amp; LOMB STEREO MICS.